The 2013 Houston Texans were an absolute embarrassment as they went 2-14. To makes things even worse, the team started of 2-0, and lost the final 14 games of the season. They could have gone 0-16, as they came back to win in Week 1 despite being down 21 points against the San Diego Chargers, and beat the Tennessee Titans in overtime in Week 2. Matt Schaub, who is now with the Oakland Raiders, lost his job as the Texans QB after week 6, when he threw a pick-6 for the 5th consecutive game. 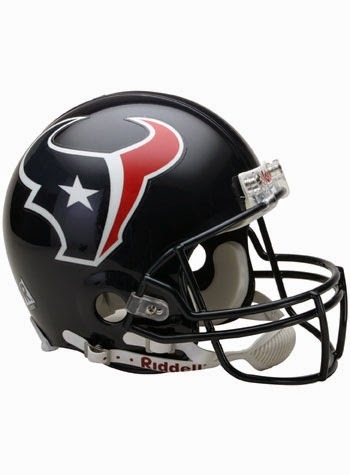 The team turned to rookie QB Case Keenum who would start 8 games for the Texans. Although he did not win any games, Keenum had a few games where he was very impressive. In weeks 9 & 10, Keenum would throw for 3 touchdowns and no interceptions, but the team lost both games 27-24. In 2014, the Texans are going in a different direction, as they signed free agent QB Ryan Fitzpatrick and drafted Tom Savage out of Pittsburgh in the 4th round. Fitzpatrick started 11 games last year for the Titans, throwing for 14 touchdowns and rushing for another 3. Houston did not sign or draft any players who will make an impact in the passing game. It'll still be Andre Johnson and DeAndre Hopkins leading the receving core, Garrett Graham being the primary tight end, with Ryan Griffin and rookie C.J. Fiedorowicz competing for playing time. The man who led Houston in rushing last year, Ben Tate, is now the starting RB for the Cleveland Browns but the Texans will have a healthy Arian Foster, who missed 8 games last year due to injuries. The team signed Ronnie Brown to help out in the run game, however Jonathan Grimes has a chance to be the backup to Foster after the team cut Andre Brown. Needing a lot of help on both sides of the ball, the Texans used the #1 overall pick to draft Jadeveon Clowney, the most feared defensive player to enter the NFL draft since Mario Williams, who the Texans drafted back in 2006. Oh and they have a guy named J.J. Watt. The Texans defense might be the best fantasy option on this team! Fitzpatrick is not an ideal fantasy football QB. He's not going to pick apart a defense and he turns the ball over too much. The Texans will most likely rely heavily on Arian Foster, like they used to a few years back. Fitzpatrick could be a nice BYE week filler, if the matchup is right. At Penn State, Bill O'Brien turned Matt McGloin into the Oakland Raiders starting QB for 6 games. We did not rank him in our QB rankings. There is a reason why Arian Foster was a consistent #1 pick in fantasy drafts over the past few seasons. From 2010-2012, Foster put up some huge numbers, averaging 1,421 yards and 13.6 touchdowns. The man is healthy again and should see a heavy workload. We ranked him 5th in our RB rankings. In the past month, Foster's ADP has fallen from end of 1st round to the end of the 2nd round and might end up as an RB2 in your league. Lately people have been leaving Andre Johnson out of the elite WR talk. At 33 years old, Johnson is still getting it done. He has stayed healthy over the past two seasons and put up 112 and 109 catches with 1,598 and 1,407 yards. He has never scored 10 touchdowns in a season, but he should be good for about 8 this year. He's worth a 4th round pick, especially if you play in a PPR league. We ranked him 16th in our WR rankings. Hopkins caught 52 passes in his rookie season for 802 yards, but scored just twice. In 2011 with the Bills, Fitzpatrick was able to target David Nelson 98 times, on top of Stevie Johnson's 135. Hopkins is a much better receiver than Nelson, and Nelson put up 51 catches for 658 yards and 5 TDs. New HC Bill O'Brien turned Penn State receiver Allen Robinson into a 2nd round draft pick in this NFL draft. He is going to do wonders for Hopkins. As a 9th or 10th round pick, you can do much worse. We ranked him 46th in our WR rankings. Owen Daniels is a member of the Baltimore Ravens now, and Graham is going to be the featured TE. He caught 3 of his 5 TDs last season in September and he didn't even play one week. He will put up some inconsistent numbers but will be serviceable when your TE1 has a BYE. We ranked him 20th in our TE rankings.